Freestanding Backdrops now come in many various designs suitable for a vast number of Events, themes and Styles! 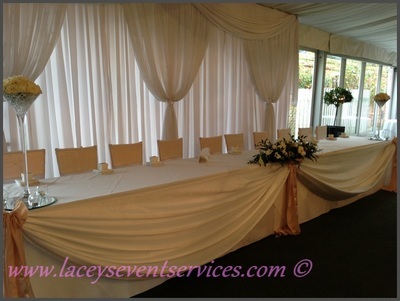 They look great on stages and behind wedding top tables to draw the eye! We are always expanding our backdrop designs to suit our clients requirements! We have a full range of Wedding & Event Backdrops available to hire including White Starlight Backdrops, Black Starcloth, Light Curtains, Flower Wall Backdrop, Grecian Backdrops, Sequin Backdrops, Romance Wedding Backdrops, Crystal Backdrops, Asian Wedding Stage Backdrops, Silk Backdrops, Freestanding Backdrops, Moroccan Themed Backdrops, Gathered Backdrops, Band Backdrops, Ceremony Backdrops & Glitter backdrops! 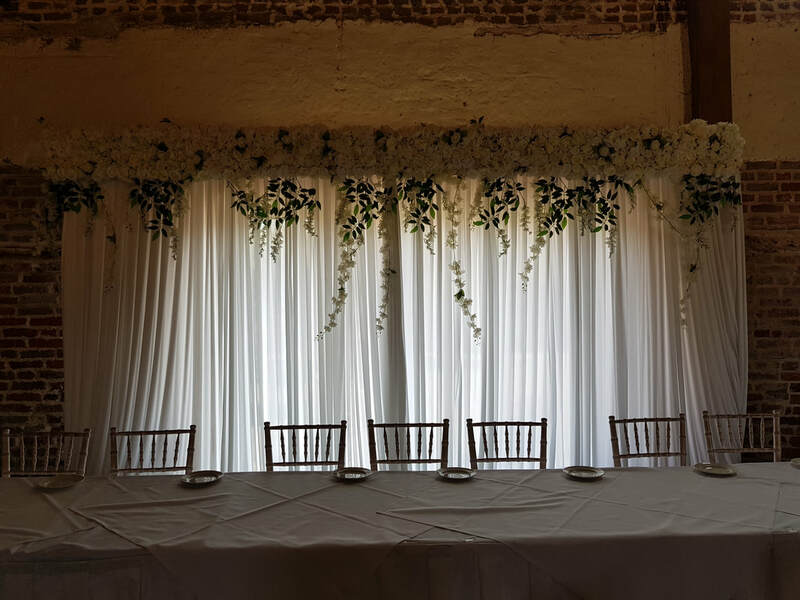 Freestanding Wedding Backdrops can be used for many purposes including dressing the top table and cake table, hiding ghastly walls and covering up horrible curtains or illuminated signage like fire exits! 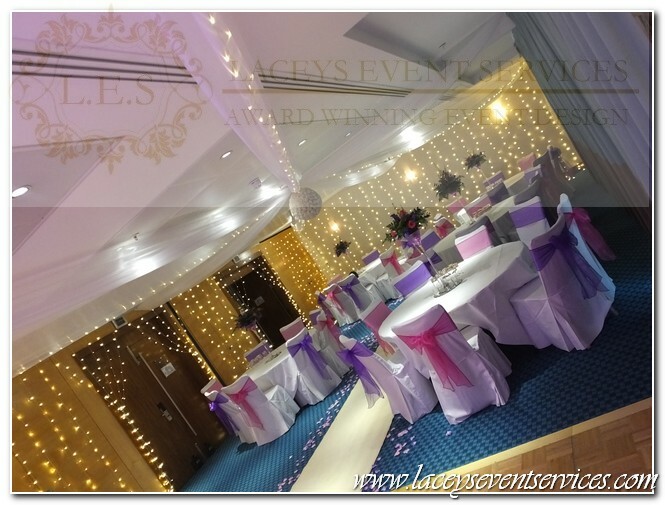 Creating the right lighting at your wedding is essential and a Freestanding Wedding Event backdrop behind the top table will create the perfect ambiance! 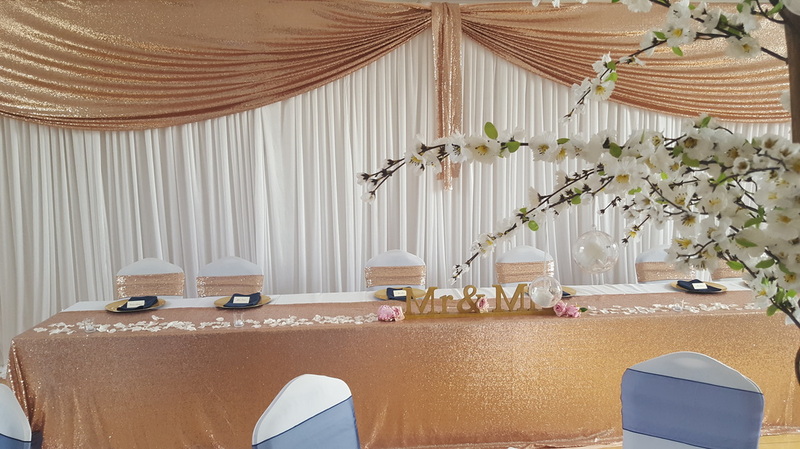 All of our wedding & Event backdrops are completely freestanding on their own support structure which means they can be placed anywhere you like in a room and do not have to be attached to a wall! 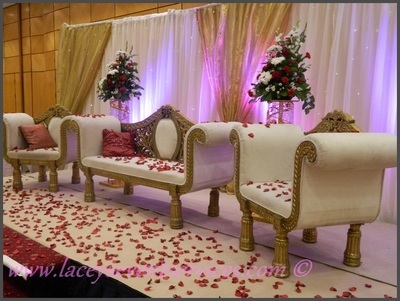 fairy-tale finish to the room decor! 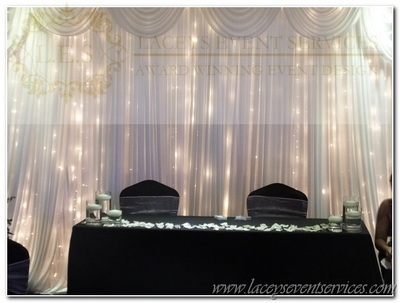 Our White starlight wedding backdrops can be adjusted up to 3 meters high and between 3 meters and 9 meters wide and comes complete with detachable top swag. 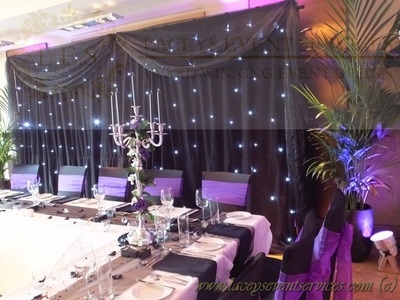 Our Black Starlight Backdrop also know as Star cloth is very similar to our white backdrop and great for alternative weddings or corporate events! Our black starlight backdrop can be adjusted up to 3 meters high and between 3 meters and 6 meters wide and comes with top swag. Looking for something subtle yet classic? 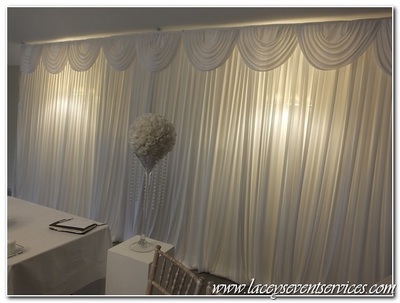 Our plain white satin backdrop with scalloped top swag will be perfect for you. 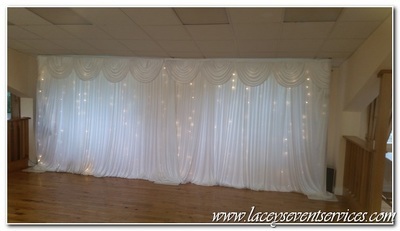 This backdrop comes in 3 meter sections so is also perfect for those extra long top tables! 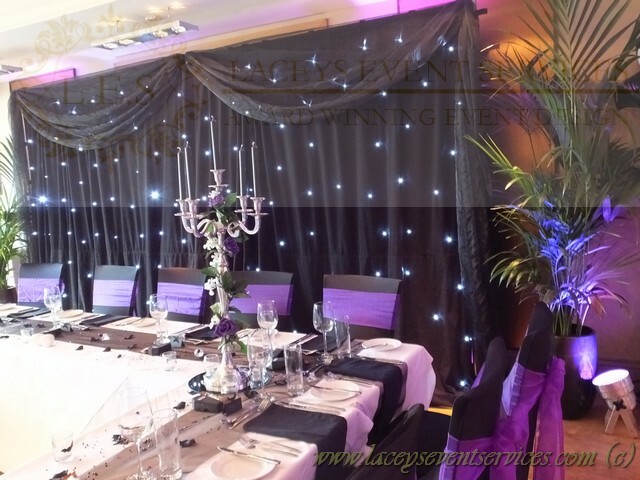 Our black satin backdrop is a matching item to the white satin backdrop above but much more suited to alternative weddings and corporate events or birthday parties! 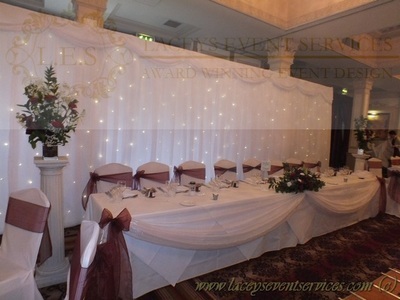 Our light curtains are very popular for brightening up dark areas and unlit venues. 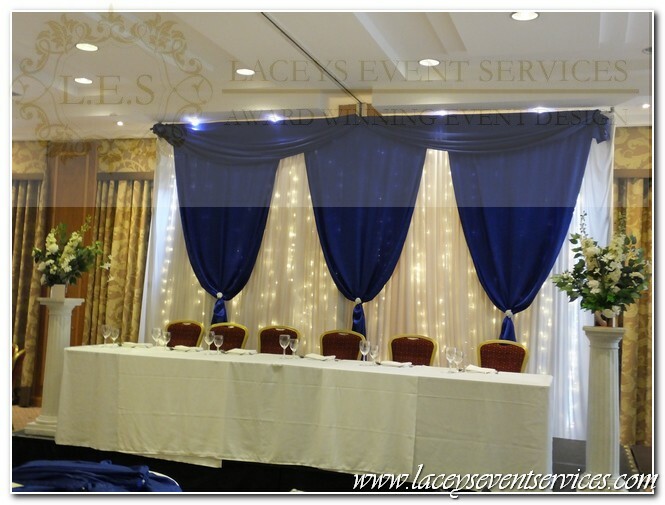 Light curtains are not freestanding and are therefore suitable only where fixings to hang them are already in place. 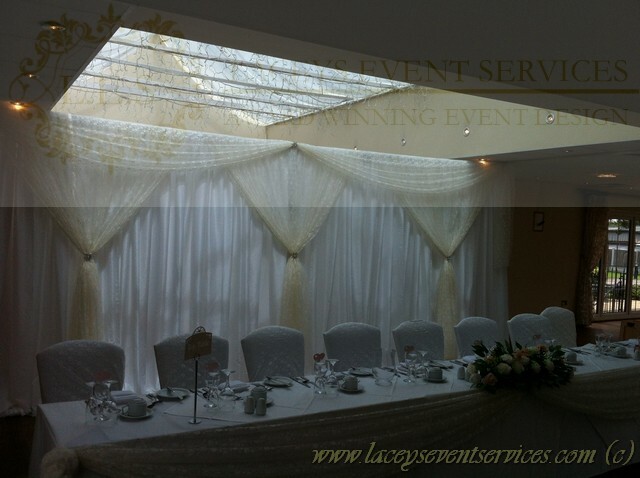 Windows with a curtain pole or runner are the most popular places to have the light curtain as they do not restrict the view through them either! 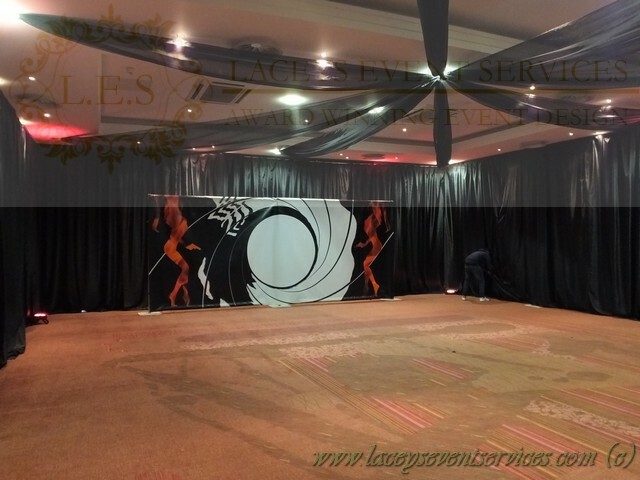 Our band and stage backdrops are made from satin fabric and can come with or without top swag depending on your preference. 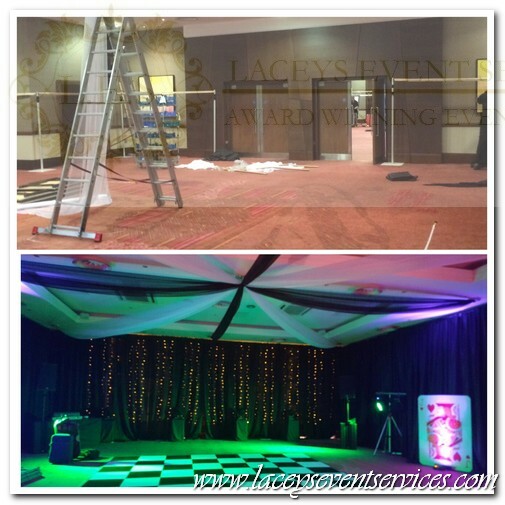 Our band backdrops can be set up at right angles to follow the line of the stage (Min 1.6m sections) and come complete with golden light net. 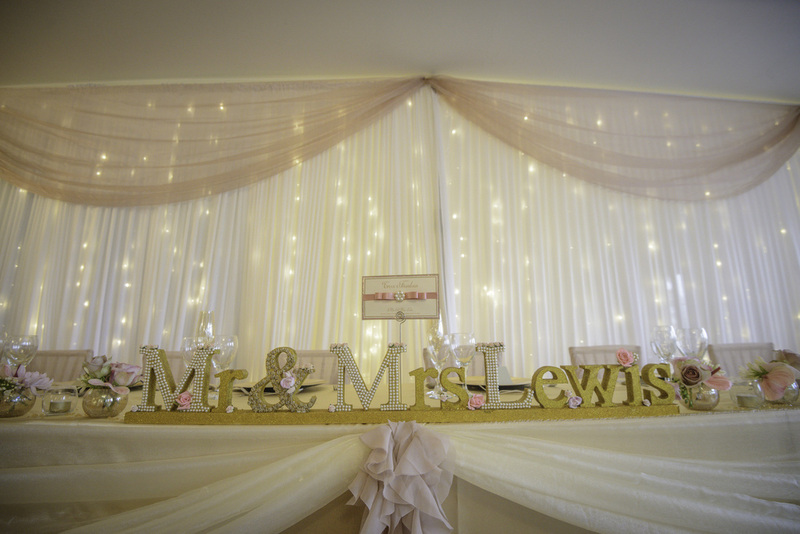 Lighting is on a multi function light box and can be set to 8 different twinkle options depending on the tempo of your music. Get the celebrity look with our stunning Flower Wall Backdrop available in Ivory and White has been turning heads since we released it in early 2015! 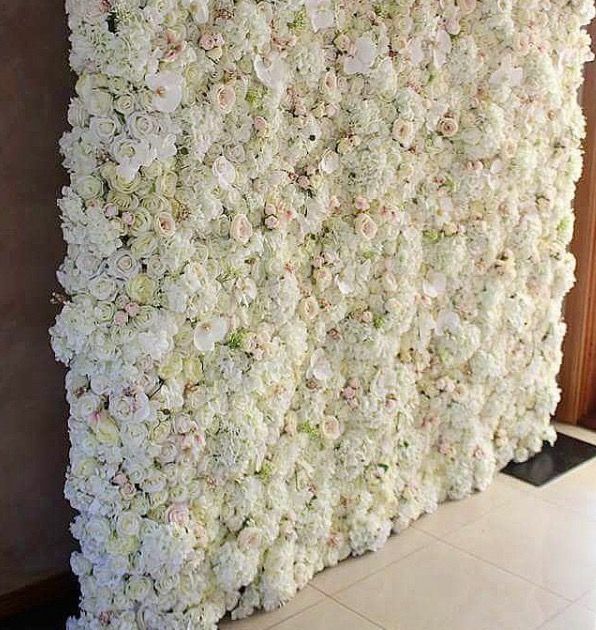 The Flower wall backdrop is made up entirely of flowers and looks even more amazing in person than in the photos! 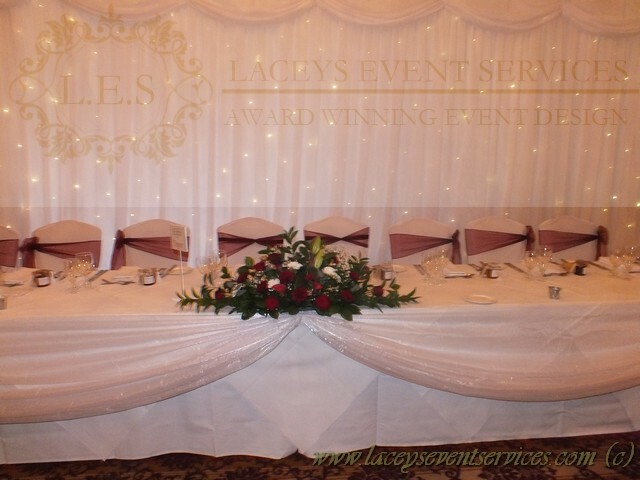 Made in House EXCLUSIVELY for Laceys Event Services is our new Flower Bar perfect with Flower Backdrop Hire and it is even more beautiful in life than in photos!! 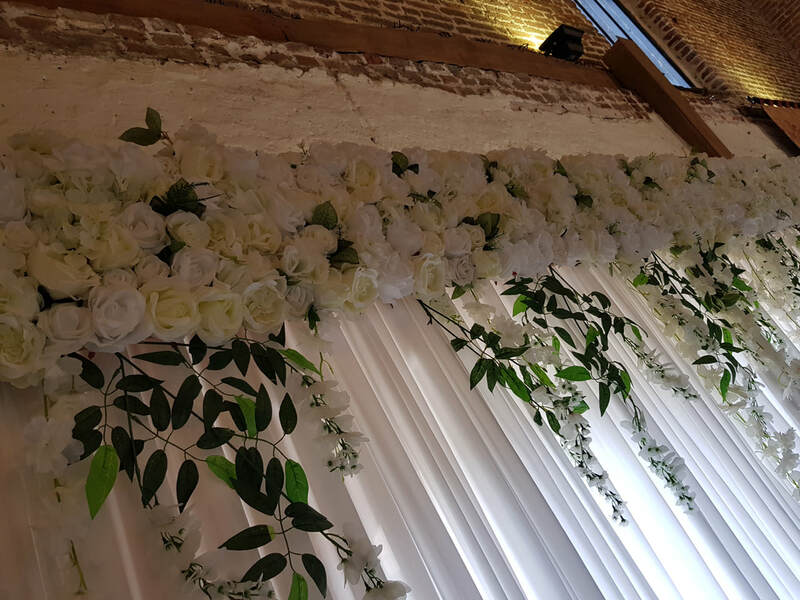 Our flower bar is perfect for adding to other products to create Flower Walls, Flower Backdrops, Flower Gazebo and Flower Accents to doors! The smallest of all of our wedding backdrops is our Wedding Ceremony Backdrop. 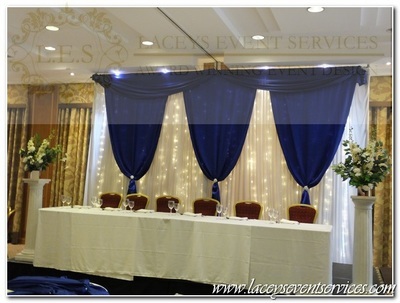 It can be adjusted to stand between 2 and 3 meters wide and up to 4 meters high and comes with optional top swag. The golden lighting behind the backdrop is electrical so will need a power point. 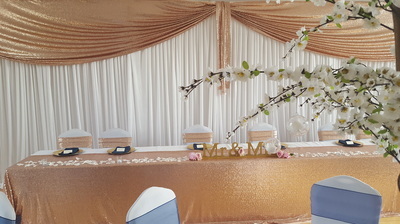 This wedding ceremony backdrop gives the fairytale photo finish every wedding needs. 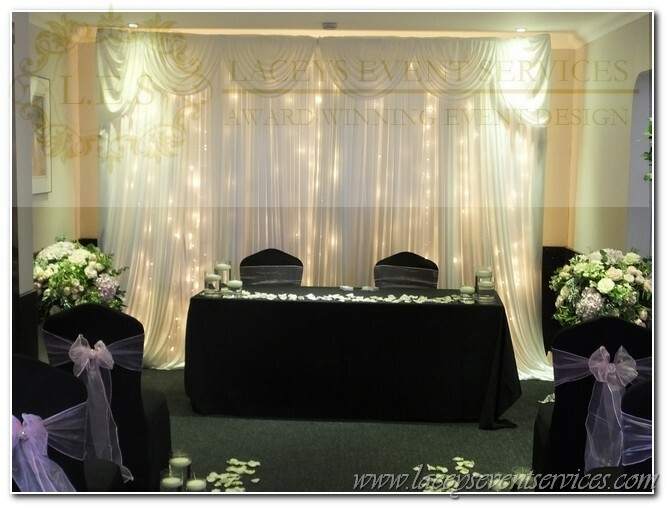 The wedding ceremony will most likely be the most photographed part of your day so it is essential you have an amazing looking backdrop for this area! Our stunning white Grecian Wedding Backdrops come in 6 meter or 9 meter wide and up to a maximum height of 4 meters. The premium white chiffon Grecian Drapes are 3 to a 6 meter and 5 to a 9m backdrop and are finished off with bows as standard. 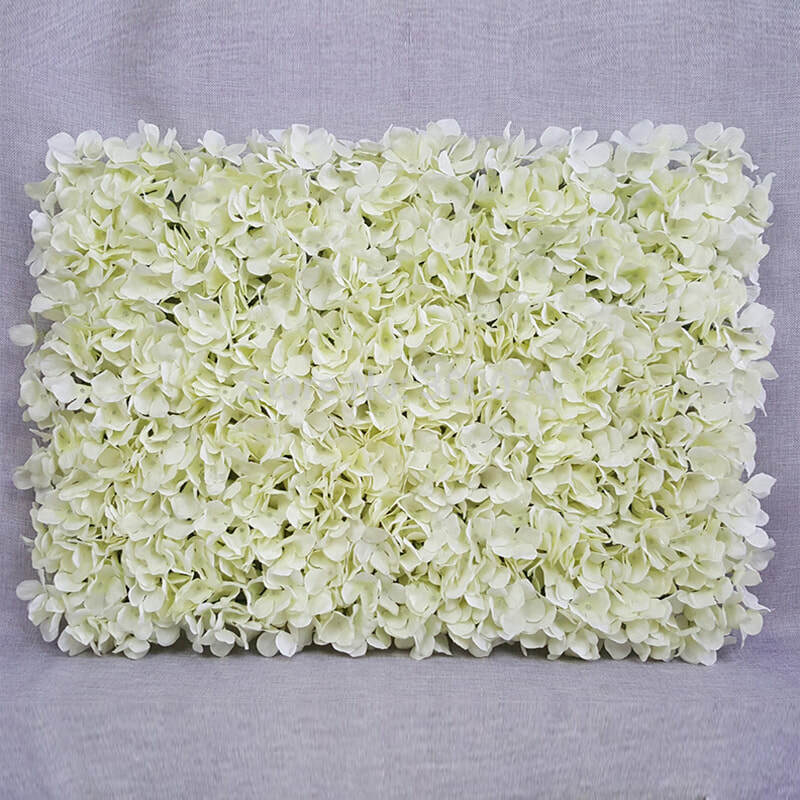 We can also add flower ties, diamante or pearls finishes if required. Our vintage lace backdrop has been a real hit with the Rustic and shabby chic themed weddings on our books. 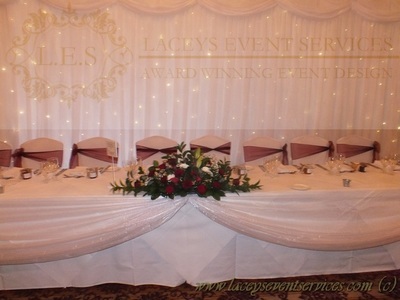 Enabling brides to still have a stunning top table backdrop whilst veering away from the modern sparkly designs! 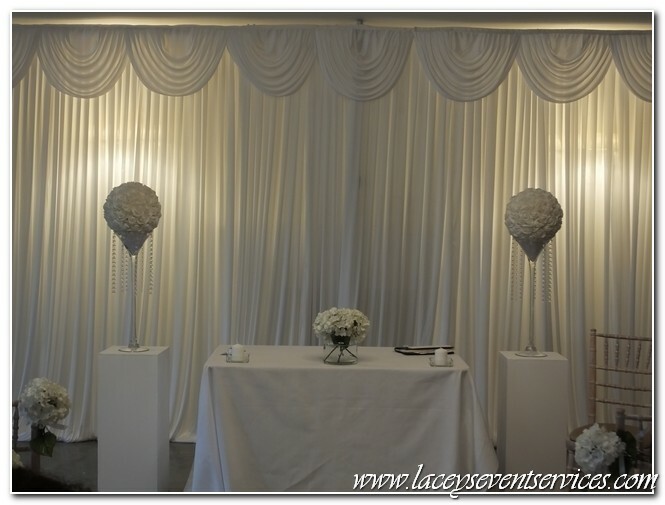 The vintage lace backdrop comes in white 6 meter or 9 meter wide and up to a maximum height of 4 meters. 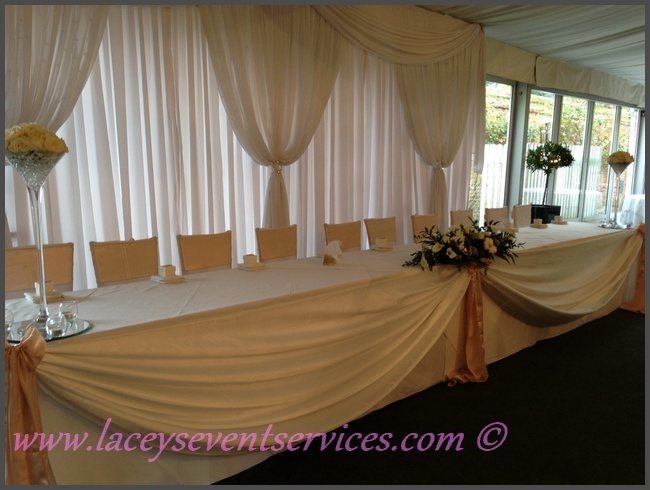 The lace draping to the front can be arranged in either cream or white or black. 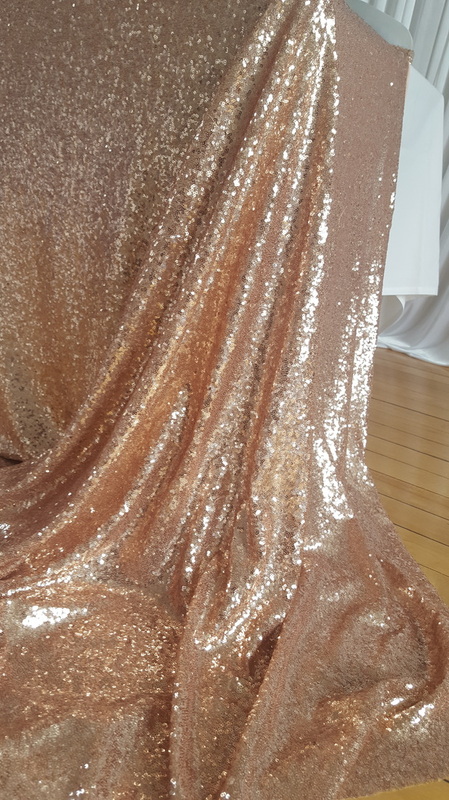 Our Brand new Sequin Glitter Backdrop is the perfect compliment to vintage chic and Giltzy Glam Weddings that are so hot right now! Be sure to sparkle with this new luxury design behind your wedding top table. 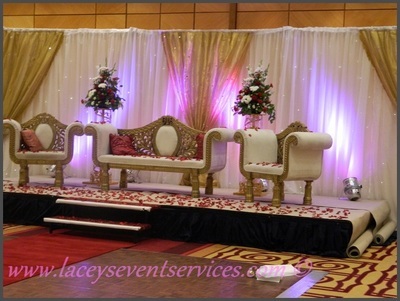 Our Indian wedding Backdrop is designed to compliment our Wedding stage designs and packages. 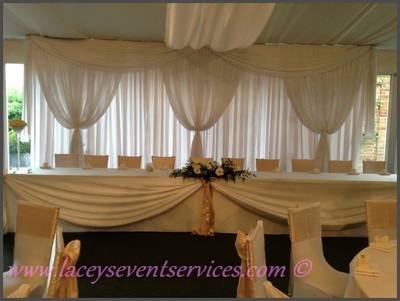 The white backdrop stands at 6m wide and up to 4 high on an adjustable support structure. 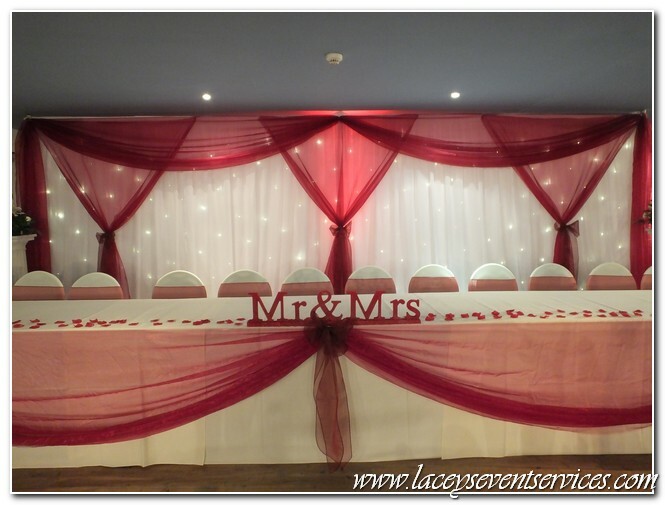 It comes completes with 3 coloured swags of your choice and 2 coloured uplighters to illuminate and accentuate the backdrop and staging. Our Asian Wedding backdrop is again designed to compliment our wedding top table packages and stage designs. 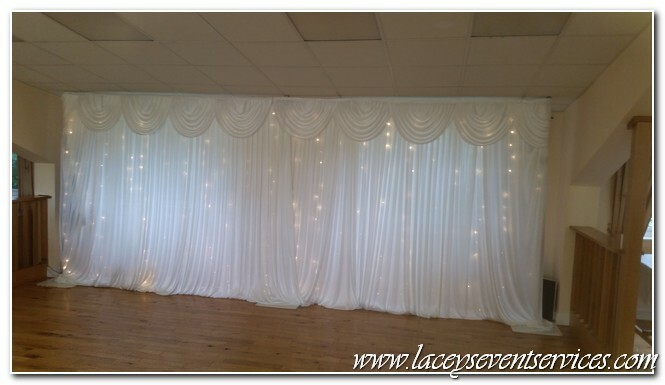 The white starlight backdrop is available in 6 meter or 9 meter wide and up to a maximum of 3 meters high with built in twinkle starlights. 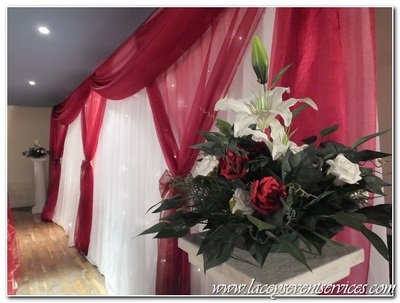 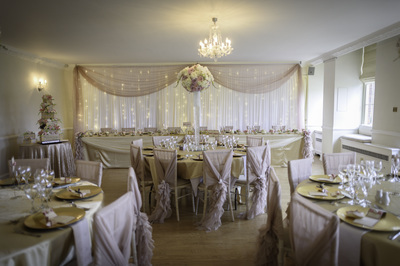 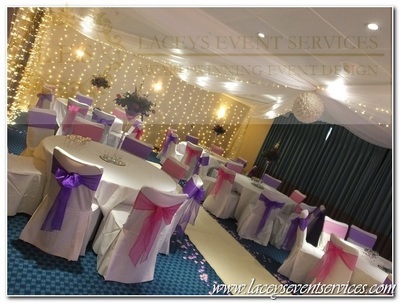 Coloured drapes are added to the front to compliment your chosen wedding theme. This Multi Coloured Moroccan themed backdrop looks amazing set up in any venue. 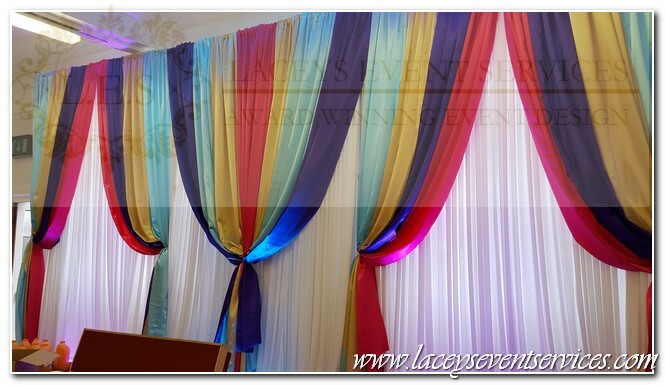 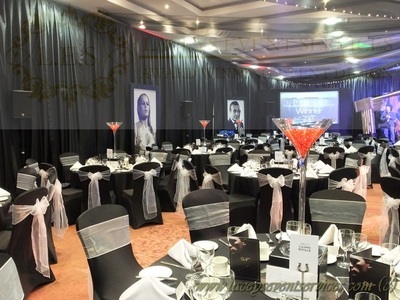 With its 24 seperate coloured drapes it certainly is the main focus to any room when set up! 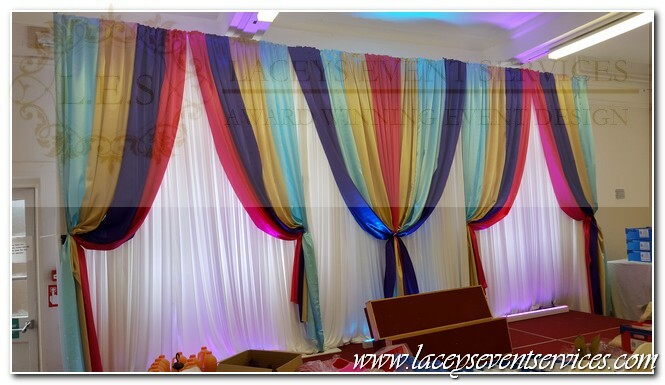 The Moroccan Themed Backdrop comes complete with 2 coloured uplighters which are placed at the 2 outer openings for even more colour! 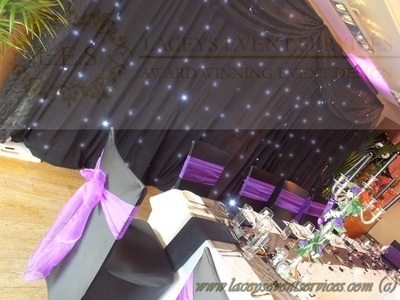 Our stunning coloured Grecian Backdrops come in 6 meter or 9 meter wide and up to a maximum height of 4 meters. 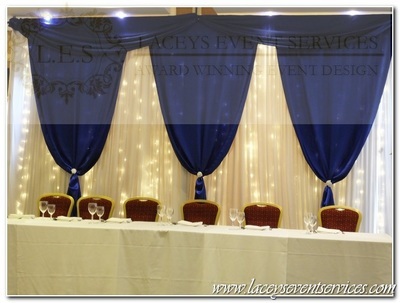 The premium coloured satin Drapes are 3 to a 6 meter and 5 to a 9m backdrop and are finished off with bows as standard. 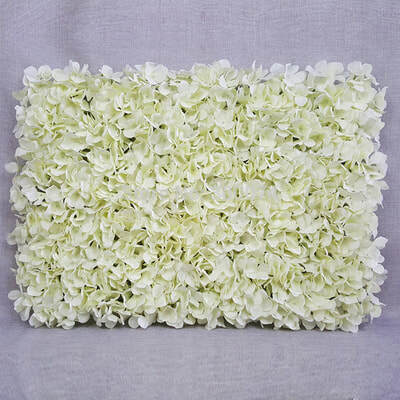 We can also add flower ties, diamante or pearls finishes if required. 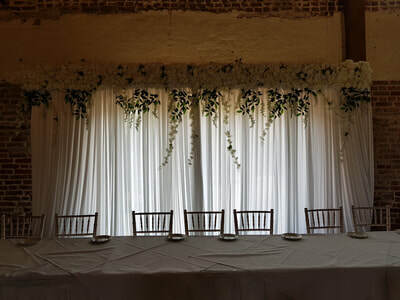 These beautiful Romance Backdrops are perfect for behind top tables at weddings. They can stand up to 4 meters high and up to 9 meters wide. They are made with premium white gathered satin with golden lighting behind them and a coloured deep voile drape complimenting your chosen colour theme to the top trailing down each side.